Woody Allen hasn’t been this light-footed in a long time. 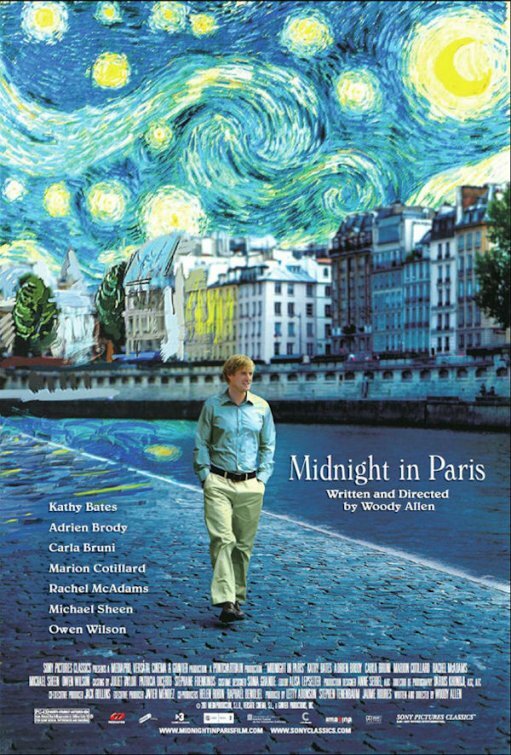 Midnight in Paris is an effervescently charming film that flirts with overt sentimentality. But before you think Allen goes all gooey, the fatalist in him pulls back for some wisdom about the folly of nostalgia. Allen’s nebbish stand-in this time is Owen Wilson, assuredly better looking but on the same neurotic wavelength of his director. Wilson is a disgruntled Hollywood screenwriter visiting the City of Lights with his shrewish fiancé (Rachel McAdams) and her upper-class parents. One night a mysterious taxicab picks him up shortly after midnight. Wilson is transported back in time to his favorite era, 1920s Paris. He gets to rub elbows with literary and artistic giants, like Gertrude Stein (Kathy Bates), Ernest Hemmingway (Corey Stoll), Scott and Zelda Fitzgerald (Tom Hiddleston and Alison Pill), Salvador Dali (Adrien Brody), and others. He even falls for a lovely lady (Marion Cotillard) from that time period who served as a muse for several artists. Midnight in Paris is a far more enjoyable experience if you have a modicum of education in the humanities. Identifying the artists of old, albeit exaggerated cartoon versions of themselves, is part of the fun, fantasizing about interacting with the greats. But Allen is also playful with his storytelling, and for a while Midnight in Paris becomes a highly refined cross-time romance (think The Lake House written by Tom Stoppard). Midnight in Paris has been catching on with audiences, becoming Allen’s biggest hit in 25 years, and it’s easy to see why. It’s whimsical while being literate and romantic without being corny. This movie beguiles me. I watched it over a month ago and I am still turning it over in my brain, and not just for the fact that I get it confused with the similar sounding yet also disappointing Reservation Road. It’s another movie that presents the suburbs as a prison of bourgeoisie social moirés about how men and women are expected to live to be happy. The movie looks magnificent thanks to skilled cinematography by Roger Deakens, even if it falls back on redundant visual metaphors (look, the windows are shaped like prison bars!). The acting by Leonardo DiCaprio and Kate Winslet, the unhappily 1950s married couple Frank and April Wheeler, is mostly impressive. Michael Shannon deservedly was nominated for an Oscar as an unhinged realtor’s son who cuts through all the troublesome and fake niceties. It is a terrific performance and jolts the movie with much-needed energy, somewhat like Renee Zellweger’s role in Cold Mountain. I think that’s where my biggest area of concern is: the movie is just kind of placidly dull. Watching people be miserable for most of a two-hour running time isn’t a deal-breaker, but the movie needs to have some life to it. Revolutionary Road feels just as morose and restrained as its assortment of doomed married couples eeking out an existence. Perhaps that is an achievement to be heralded for director Sam Mendes. Then again, perhaps it just means I felt purposely remote and directionless and just waited for the movie to expire.